October 11, 2016 — Lindsey and I had driven 3.5 hours from southern New Hampshire to Manhattan that morning only to be told that the roof of the MET was closed due to rain. That meant we wouldn’t be able to see the Psycho House. This post isn’t making any sense, so let me start over. 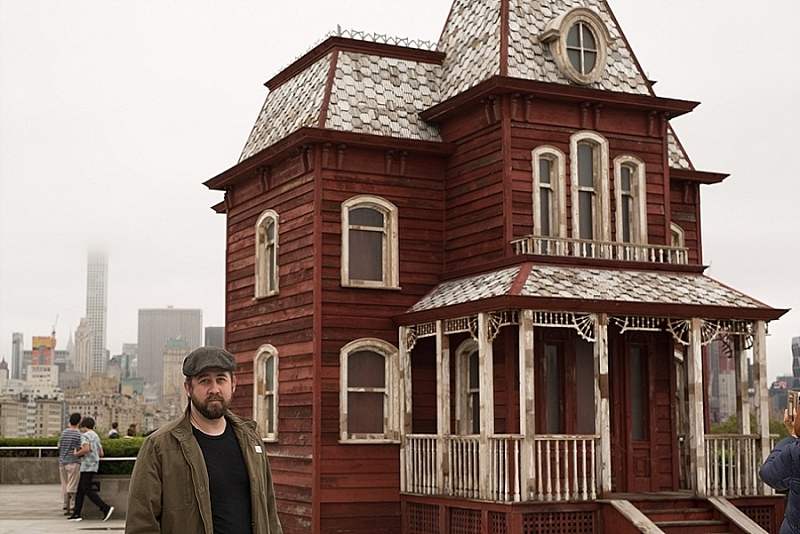 I am obsessed with the Psycho House as a thing. Not just as a set and a prop and a character in Alfred Hitchcock’s 1960 film classic, but as an object. Just looking at it makes me happy. I don’t know why. But I do know that it’s the reason why I’ve seen just about every single film and TV show that has featured the house or a facsimile of it. All four Psycho movies. The Gus Van Sant remake. The 1987 Bates Motel TV pilot. The first three seasons of the modern Bates Motel (still working on Season 4…and, yes, I already know the big spoiler that’s not a spoiler). Even the Knight Rider and Murder, She Wrote episodes that it starred in. The original Psycho House still stands today on the Universal Studios Hollywood backlot, where you can see it on certain tours. It’s something I’ve wanted to do for so long that I almost don’t want to do it. If that makes any sense. So what was I doing trying to get to the roof of one of the most prestigious art museums in the world? And what the heck does that have to do with a 56-year-old movie set? It’s all because of English artist Cornelia Parker. But let’s get to that roof first. After being told that it was closed, I bemoaned my existence for a bit. After all, the thing I wanted to see was only a temporary exhibit, one that’ll be dismantled after Halloween. This was probably my only shot to see it. But then, like patients looking for a second opinion, we headed to an information desk closer to the elevators that go to the roof. “Oh, it just opens late today because of the rain,” the attendant told us. “Actually, your timing is perfect because it opens in four minutes.” I stabbed the air multiple times in celebration. We took the elevator to the roof and there, in the far corner, looming above Central Park and back-dropped by fog-enshrouded skyscrapers, was the Psycho House. Except that it was at a smaller scale. And red. Like a barn. And that’s because it was made from a barn. 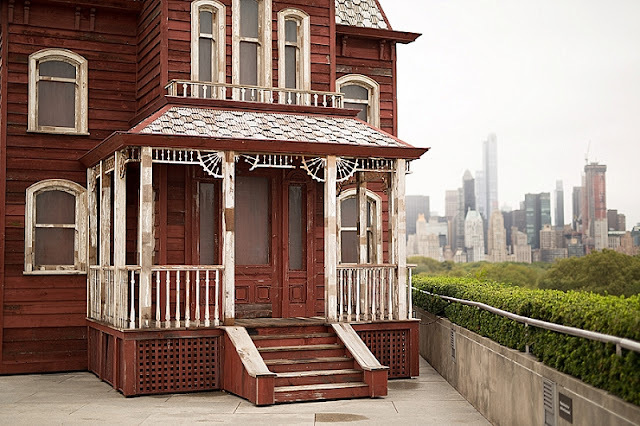 Cornelia Parker used the planks and tin roof of a barn from a dairy farm somewhere upstate and constructed a 30-foot-tall replica of Hitch’s famous house there atop the museum. She called her piece Transitional Object (PsychoBarn). I kind of wanted to call it home. 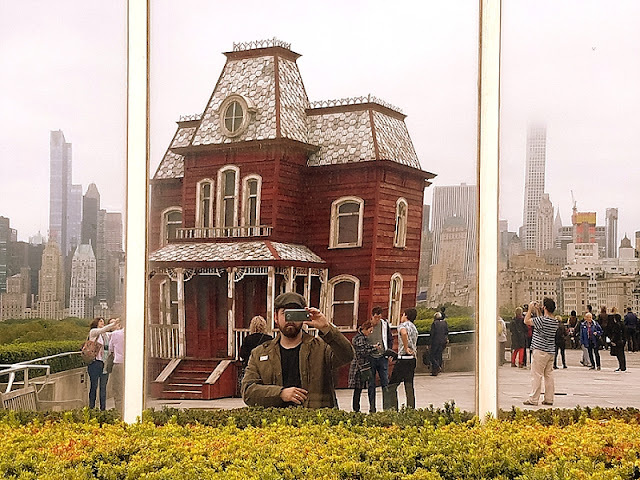 And if that seems a bit too pop-culture-y for a place like the MET (it’s not), the original Psycho House was based on a painting by American painter Edward Hopper called The House by the Railroad. And that’s what gave Parker the idea. 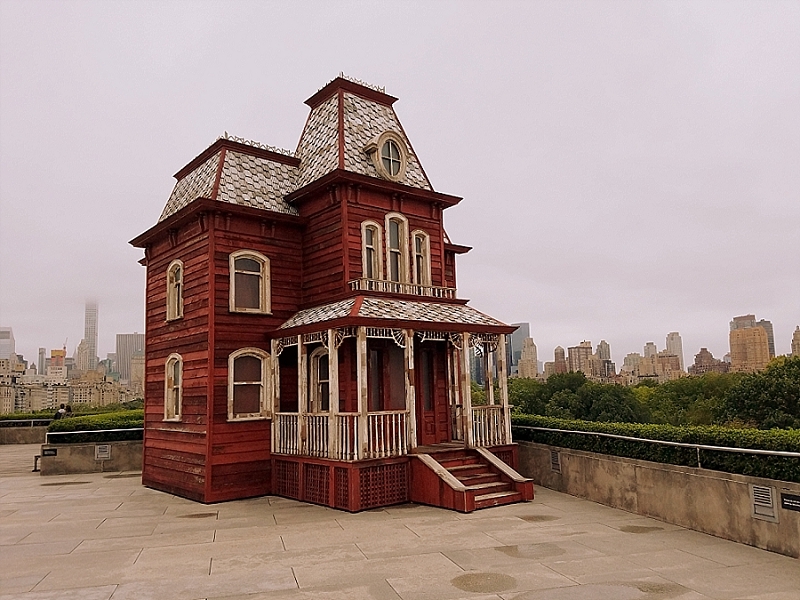 Originally she just wanted to build a big red barn on the roof to contrast with New York’s uber-urbanity. But something like that wouldn’t fit, and she couldn’t really do a smaller scale version, I assume, because it would just look like a shed. When she learned about the Edward Hopper connection to the Psycho House, she got an idea. See, Hopper also painted red barns of the sort she had wanted to use. So she smashed the two ideas together. The PsychoBarn looked great both from afar and up close, all weathered and ominous-looking…although less ominous than the original due to the red boards it had been assembled with. 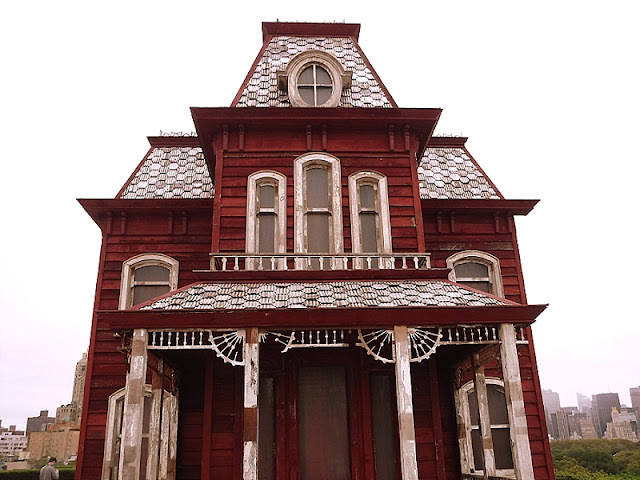 And that was purposeful, as Parker aimed to tie together the wholesomeness of a salt-of-the-earth barn with the threatening look of the Psycho House. I walked around it looking up at the windows for the silhouette of an old woman in a rocking chair, but didn’t see anything. Norman had probably already moved her to the basement. Although that would’ve been pretty weird because the basement is, in this case, you know, the Met. He could’ve hid her in the Egyptian Art collection, I guess. 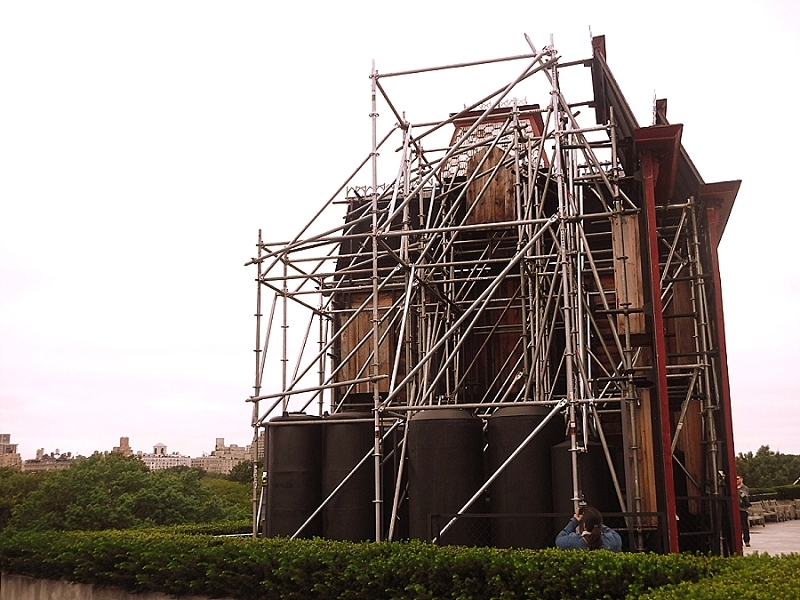 Eventually, I made it to the rear of the installation to find nothing but metal scaffolding. 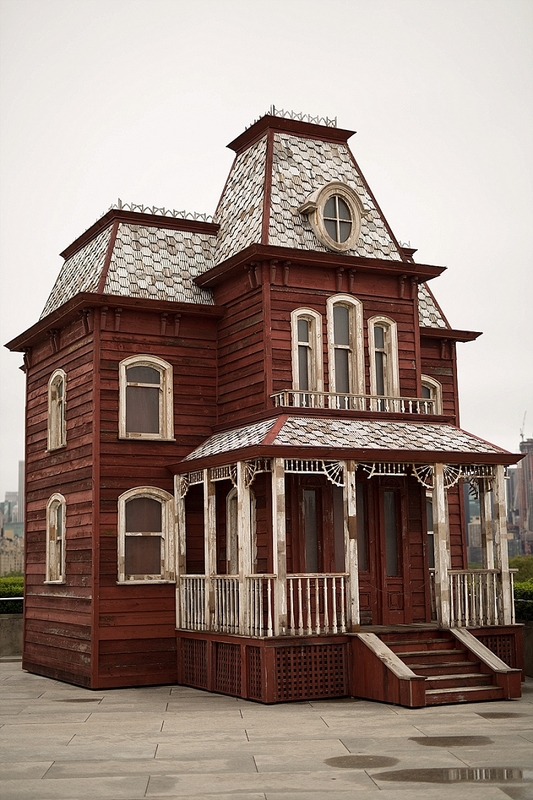 Transitional Object (PsychoBarn) was a mere two-sided façade. A house-shaped and -sized mask. Although that’s no bummer. The real Psycho House is a two-sided façade, as well. I don’t know exactly what Parker is trying to illustrate with this incongruous architecture, if anything. But I like the idea of a barn masquerading as a murderer’s house. Kind of like old Norman Bates himself, whom Anthony Perkins was able to brilliantly depict as a strange mixture of the innocent and the evil. And it made me want to jump on a plane for Universal Studios Hollywood right away.